The holidays are the ideal time of year to kick your outfits up a notch and make everything a bit fancier, and we've found that the best way to do that is via your accessories. But you're probably thinking that the last thing you want to do right now is spend more money, what with the strain of gift buying and travel expenses likely putting a sizable dent in your budget. Which is why what J.Crew's head stylist, Gayle Spannaus, had to say to Popsugar about a universal holiday styling tip really resonated with us. She said, "Don't ever underestimate a piece of velvet or grosgrain ribbon. It's something we all have—it can be tied in a bow around a pair of jeans for an added embellishment, switch out your watch band with a beautiful velvet ribbon, tie a bow around the neck or waist with a crisp white shirt, there is so much that can be done." Her tip got us thinking about all of the other uses for a piece of ribbon as a festive holiday accessory, including wearing it as a choker, as a headband or hair bow, adorning the strap of your handbag, tied around your wrist, or even looped into your shoes in place of your usual laces. And perhaps the best part is that there are plenty beautiful satin and velvet ribbons to be found for approximately $2 to $3 per yard. Can't beat that. Keep scrolling to shop ribbon from one of our favorite sources, and head over to Popsugar for the rest of Spannaus's holiday tips. 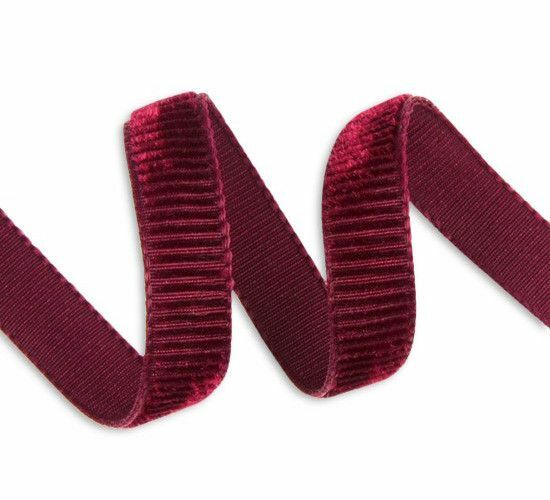 This ribbed ribbon screams holiday season. A dash of pink would add interest to an all-black outfit. There's no such thing as too much velvet this season. How would you use ribbon to make your holiday outfits better? Tell us in the comments!